View More In Snow Shovels. 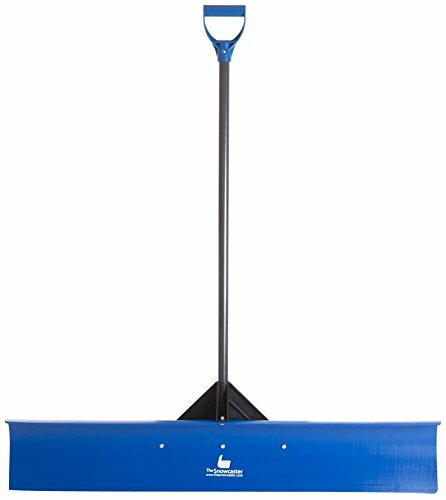 The Snowcaster 48UPH Pusher Shovel with 48-Inch Heavy Duty Plastic Blade is light weight, durbale, and easy to use. The blade is made with Ultra HIgh Molecular Weight Polyethylene material which is a high wear, impact resistant plastic that also provides a surface finish that helps prevent snow from sticking to the blade during use. The bracket and handle are re-enforced at the point of attachment to the fiberglass tube. This product assembles in less than 10 minutes and has a proven commercial application. The Snowcaster products are manufactured by Mangin & Associates, the snow and ice removal experts. For more than 20 years, we have led the way in helping people, companies and cities manage snow and ice to improve safety, mobility, and quality of life. Dissatisfied with the quality and availability of snow removal tools, we decided to use our expertise to provide products that offer superior performance and value. With the Snowcaster line of products, we have taken our years of specialized industry knowledge and used them to manufacture products that are affordable, durable, eco-friendly, and incredibly easy to use. All of the Snowcaster's products are proudly made in the USA, and we back them with a full one-year warranty. If you have any questions about this product by The Snowcaster, contact us by completing and submitting the form below. If you are looking for a specif part number, please include it with your message.